Akira Kurosawa’s Seven Samurai is not only one of the greatest films of all time it also happens to be one of my favourites. It’s one of those movies I tend to go back and watch more often than I probably ought to. It’s one of those films that for some strange reasons I take great comfort in, the sort of thing that I kind find inspiration in when I need it, or loose myself in when I don’t really want to think about something else, like today. For those who aren’t familiar with it the plot revolves around a small villages struggle to stave off a group of marauding bandits. In order to do this they recruit Seven samurai to defend them, but because the village is so poor the samurai will be paid only the rice they eat. The film is over three hours long, in fact over an hour of the film is dedicated to the villagers struggle to find and recruit a number of samurai willing to fight for them, for so little reward. The movie is very emotive,particularly in the opening half hour the plight of the farmers is almost unbearable to watch such is their suffering. The task of hiring samurai seems impossible especially when all they have to offer is rice. What makes this such a classic movie though is the depth of detail and characterisation Kurasawa provides, and the painstaking effort he makes in creating a sense of 16th century Japanese society. The interactions and tensions between the samurai and the villagers are frequent and often awkward, each group having its reasons to mistrust the other. The samurai could oppress the villagers as much as the bandits. Call me a romantic but for me what makes the movie truly magical lies in how the heroism of the seven emerges in their willingness to do what is right, no matter the outcome, and to help those who need it without making judgements about their fallabilities or their occasional immorality. 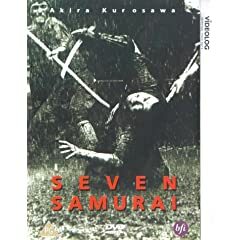 Even the end of the film is striking with the battle won the villagers celebrate their victory but ignore the samurai for whom they no lnger have any use, leaving the surviving samurai to reflect on the relationship between the warrior and farming classes. Kurasawa’s movie was one of the first to use, the now common, plot device of recruiting and gathering a group of heroes into a team to accomplish and impossible mission. Another of my favourite movies The Magnificent Seven, is a recreation of this. In fact this movie served as the inspiration for a swathe of others, and there are many, like me, who subscribe to the view that Kurasawa’s classic pioneered the modern action movie. The final rain soaked battle scene is without a doubt one of the most stunningly filmed sequences ever. If you have never seen this movie you must watch it , you will not be disappointed! 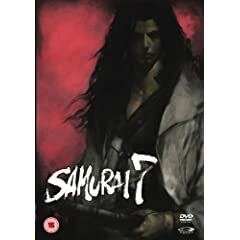 On the back of this I’ve recently finished watching the complete series of Samurai 7. This anime series is based on Kurasawa’s classic but sets the story in a bleak future where the bandits, or Nobesari, are plundering villages all over the land. These men are former Samurai’s who have abandoned their code of honour and adapted technology to their bodies until they no longer resemble humans. The series is made up of 26 half hour episodes, and much in the same way Kurasawa dedicated so much of his film to detailed characterisation so too does this series. The quality of the animation and sound is absolutely superb. I thoroughly recommend it, but only after you have seen Kurasawa’s classic! Be warned IMHO this is definitely not a movie for the kids, I don’t care what the 12A certificate says!! On the up side though it’s an extremely moving piece, in fact I’d expect no less from any adaptation written by Neil Gaiman, who succeeds in portraying Beowulf as both a hero but a also a man, who in many was was deeply flawed and fallible. I have had a very long week at work, it’s been a lot of fun but I often fall foul of becoming entirely absorbed with what i’m doing and that kind of tunnel vision leads to me totally ignoring everything else going on around me. Fortunately though I did get a chance to go out earlier on in the week to watch the new Harry Potter movie at the IMAX here in Birmingham. The last 20 minutes of the movie where in 3D and it was stunning! 3D in cinema has come a long way, although I did find that after the film had ended I had an awful headache and felt quite dizzy for a day or so. Oh well! The film itself was very enjoyable and whist the book was very dark and in ways very disturbing the film didn’t focus on the darker or sadistic elements of the fifth book. It’s also impossiblet to squeeze everything in the book into two and half hours on screen but I still found the film to be extremely enjoyable. If you get the chance to watch it in 3D I do recommend it! It’s tonnes of fun! As for the film, as far as tragedy’s go this one might have driven Shakespeare to suicide! It’s one of the most bizarre movies I’ve ever seen. Yet the sets, costumes and cinematography are absolutely stunning. Don’t make the mistake of thinking this is another Crouching Tiger, Hidden Dragon because it couldn’t be futher from that. The story revolves around an Emperor who is secretly poisoning his wife, she in turn is plotting against him using his sons to overthrow him. It’s basically the story of a rotting family that destroys itself in one night. I thought the film was very good, I struggled to keep up with the plot but the acting was superb. After work last night Amanda and I with a group of friends went to watch Frank Miller’s new movie: 300. 300 is an adaptation of Frank Miller’s graphic novel, which I remember reading years ago. The movie is extremely faithful to the original graphic novel. It’s one of the most visually stunning movies I’ve seen in a long time, and as you’d expect from one of Miller’s works, its extremely graphic in its violence. For those who dont know, the movie tells a pseudo-historical account of the Battle of Thermopylae, which took place around 430 BC. The then Spartan king Leonidas along with his personal guard of 300 Spartans defended the narrow pass at Thermopylae against the Persian King Xerxes and his army numbering over a million for three days. With the odds so heavily against them they knew they would die, yet they sacrificed their lives to give the rest Greece time to unite and mobilise against Xerxes invading army. The special effects in this movie are incredible, but it’s the slow motion closeups of the fighting between the two arms that is breathtaking to watch. I thoroughly recommend this movie, you wont be disappointed! Had an interesting evening last night. Was feeling a bit down so Amanda decided to cheer me up, after work we went to a Morrocan restaurant in the city center called Zaragoza’s which was actually really really good. We spent a couple of hours there chatting before heading of to the cinema to watch Notes on a Scandal. It’s not often a movie creeps me out to the extent that I can’t sleep, but this one sure as hell did. Kind of wish we had just watched Hannibal Rising instead … ok im being unfair the film was excellent Dench gave an amazing performance as Barabara Covett, an unpopular and lonely old history teacher. Blanchett’s performance was also excellent as Sheba Hart, the new arts teacher who embarks on an affair with an underage student. All in all the the evening was a lot of fun, and I it did cheer me up … so thanks Amanda! Forrest Whittaker’s performance as Amin is terrifying, I’ve said for a long time that Whittaker is an amazing actor and he proves that in this performance. Towards the end the film becomes quite grisly as you might expect given its setting. Nonetheless it was an excellent film, and well worth watching. Vandy is played by Djimon Hounsou who gives an excellent performance. Infuriatingly I have to admit Di Caprio was also exceptional in the movie. It’s a very grim tale, and the film is quite grisly in parts as you might expect given the story is set against the back drop of the brutal civil war in Sierra Leone. Its a great movie, the cinematography is exceptional, the locations in Africa were beautifully filmed. The scenes in South Africa brought back some wonderful and even painful memories for me, there’s a part of me that will always believe there’s a big part of me still there, I loved all the time I spent in Cape Town … sometimes I wish … never mind … if wishes were horses beggars would ride! Anyway go watch the movie, its excellent – great pick Amanda!. I have to confess I wasnt sure I would like the movie, still have horrible memories of Rocky V. However this was a really enjoyable film. It was a suprisingly good script very much in the tradition of the first two films, although not as good as either of those. It’s definitly fun, and another one of those feel good movies. Even though I’m going to get labelled a guardian-reading-tree-hugging-liberal (or worse) by Sam, I’m gonna go ahead and admit that I really, really enjoyed the film. It was really wonderful, magical and extremely heart warming. It was tinged with a little sadness half way through but the film ended beautifully. Renee Zellweger’s performance as Beatrix Potter was excellent as was Ewan McGregor’s performance as her publisher. The location’s particularly in the Lake District and the Isle of Man were stunning. I loved the way they combined animation into many of the scenes. I definitly recommend the movie!